← Is JPMorgan Chase a Good Investment? Hillary Clinton famously told ABC’s Diane Sawyer in 2014 that she and Bill Clinton left the White House after his second term “dead broke.” But apparently, Citigroup felt they were a good investment. According to PolitiFact, Citigroup provided a $1.995 million mortgage to allow the Clintons to buy their Washington, D.C. residence in 2000. That liability does not pop up on the Clinton disclosure documents until 2011, showing a 30-year mortgage at 5.375 percent ranging in face amount from $1 million to $5 million from CitiMortgage. The disclosure says the mortgage was taken out in 2001. Citigroup has also committed $5.5 million to the Clinton Global Initiative, a charity run by the Clintons. It has also paid enormous speaking fees to Bill Clinton. What has Citigroup gotten from its outsized support of the Clintons? Bill Clinton is the President who repealed the most important investor protection legislation of the past century, the Glass-Steagall Act, an outcome heavily lobbied for by Citigroup. Hillary Clinton has signaled to Wall Street that she will not push to have the Glass-Steagall Act restored while her leading opponent, Senator Bernie Sanders of Vermont, vows to restore it and return sanity to America’s financial system. Just nine years after Bill Clinton signed this massive deregulation of Wall Street and gave Citigroup’s Sandy Weill a souvenir pen from the signing, the U.S. financial system collapsed in the greatest implosion since the Great Depression. Two years before the collapse, Sandy Weill had exited Wall Street as a billionaire as a result of this deregulation, while Citigroup became a penny stock in the crash and a ward of the government in the greatest taxpayer bailout in U.S. history. Fischer said he thought his Citigroup experience would help him. One of Hillary’s strengths according to the Times’ endorsement is that she has engaged in a “lifelong fight for women,” a statement that only resonates in some Orwellian universe intractably mired in Newspeak. Hillary Clinton is the woman who stood by her man as multiple women came forward to accuse him of adultery or sexual assaults. Hillary Clinton is the woman who served as First Lady as Bill Clinton eviscerated the lives of poor children and single mothers by enacting welfare reform, a program so draconian that Senator Edward Kennedy called it “legislative child abuse” and voted against it. As a result of Bill Clinton’s handiwork in the repeal of the Glass-Steagall Act, millions more women and children and families were thrown into poverty during the financial crash; 10 million people were forced from their homes through foreclosures, while Bill and Hillary’s rich campaign supporters became even richer – right along with the Clintons. According to the Washington Post, in less than a year and a half, Hillary and Bill Clinton earned over $25 million in speaking fees, a significant portion of which came from Wall Street firms. In 2012, Hillary’s last full year as Secretary of State, Bill Clinton socked away an astonishing $16.3 million in speaking fees. When Bill Clinton took his seat in the Oval Office in 1993, the national debt stood at $4.4 trillion. In 2007, prior to the crash on Wall Street, the national debt stood at $9 trillion, expanding significantly because of the ill-advised and ill-fated war in Iraq for which the Times had waved the pompoms. America’s national debt has again doubled, in just eight years to $18.9 trillion, because of the Wall Street crash, the taxpayer bailouts, the fiscal stimulus required to shore up the economy because of the crash, and the lackluster growth that has resulted from the financial dislocations ushered in by the repeal of the Glass-Steagall Act. Exactly how many times can you get critical issues wrong and still call yourself the paper of record? 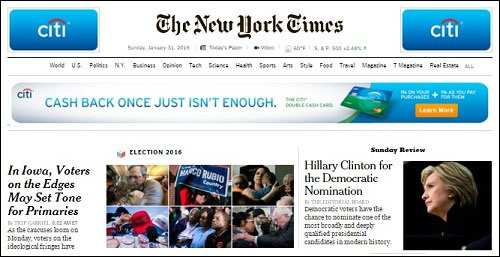 If the New York Times was hoping to provide a boost to Hillary’s prospects, this endorsement may have backfired. If the editorial page editors are studying the outpouring of comments, they are quickly assessing that the public is not only fed up with establishment candidates but also with the establishment media. Bernie Sanders and Elizabeth Warren have unleashed the furor of the populace and there’s no way this genie is going back in the bottle anytime soon.